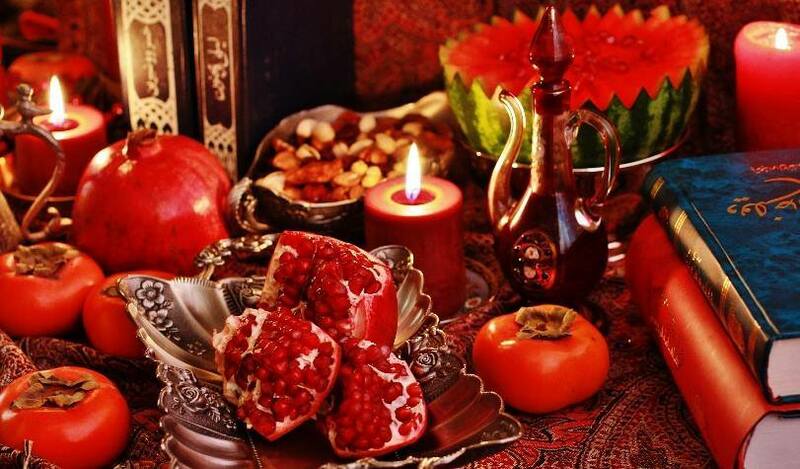 Iranians around the world celebrate Yalda Night (also known as Shab e Chelleh) on the 21st to 22nd of December according to the Gregorian calendar. Iranians celebrate the arrival of winter and the renewal of the sun on the longest night of the year. This celebration dates back to the time when majority of Iranians were followers of Zoroastrianism prior to the advent of Islam. Although the religious significance of this night has been lost, the old traditions of staying up late in the company of friends and family have been retained in Iranian culture to the present day. Food plays a central role; dried nuts, watermelon and pomegranate are served. The colour of these fruits symbolize the cycle and glow of life, and Iranians believe those who begin winter by eating summer fruits will not fall ill during the cold season. Also, the classic poetry of Hafez, the Iranian poet of 14th century AD is read by the eldest member of the family. What is expressed in that poem is believed to be the interpretation of one’s wish and whether it will come true. This is called Faal-e Hafez. In addition to Iran, other countries such as Afghanistan, Tajikistan, Uzbekistan, Turkmenistan, Azerbaijan and Armenia share the same tradition and celebrate Yalda Night annually at this time of the year.